Last week I told the blog's readers about Jeff's recent book The Church: Why bother? Many of you may already have come to know Jeff as the author of the outstanding work The Fatal Flaw of the Theology Behind Infant Baptism and as a contributor this blog. 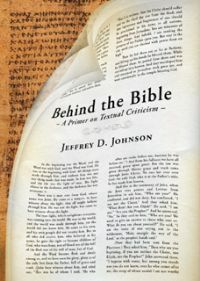 Well, this week I want to tell you all about yet another new book by Jeff entitled Behind the Bible: A Primer on Textual Criticism. The focus of the book is on textual criticism of the New Testament, and Jeff gives a thorough yet concise and readable presentation of the need for textual criticism, paleography, textual faithfulness, the method of textual criticism, and the history of the Greek New Testament text. Having read the book myself, I can tell you that Jeff does his usual terrific job of writing about important topics in an understandable way. In fact, I have given copies of the book (along with the other two books written by Jeff) to men in my congregation who have been pleasantly surprised out how accessible Jeff makes even sometimes difficult issues. It has led to some great discussions with them as I seek to help them grow in their faith. Jeff has a pastor's heart, and it shows on every page of his books. It also helps others of us who serve as pastors to teach important doctrine to our people. With such endorsments by James white and Richard Belcher, I hope you will be encouraged to give it a read yourself. Again, you can purchase you copy here. I pray that you will be as encouraged helped by Jeff's writings as I have been! Jeff Johnson, the author of The Fatal Flaw of the Theology Behind Infant Baptism and a contributor to this blog, has written a new book entitled The Church: Why bother? Having read the book myself, I wholeheartedly recommend it as a solid introduction to the Bible's teaching on the nature, purpose, functions, and importance of the local church. I am glad to recommend this new book by Jeffery Johnson, which confronts such ignorance in a very clear and Biblical manner. The book is very brief and direct and even applicable and necessary, especially for our day. The book covers almost every aspect of what a church is and what it should and should not be doing, according to the Scriptures. It can be used by the individual pastor or Christian to learn his duty to his church, or it can be the foundation of a series of sermons to enlighten a church in these areas, or it can be used as Sunday School material or in individual classes or Bible studies. If readers say they already have such books, I would tell you I do too. But every age is different, as it seems our churches slip further and further away from Biblical truth, in the passing of time, and they lean more and more towards the use of the latest unbiblical methods and thoughts of church ministry and church life. Here is a book which deals with the modern age in which we live, and the weakness of the church and churches of our day, and without fear the author sets forth Biblical truth as to what the church of our Lord Jesus Christ needs to be today according to Scripture! Be sure to visit the Solid Ground Chrsitian Books website to order your copy today. The movie Courageous has been a serious eye opening tool God is using in men all over the world. It has brought to light a serious deficiency, the lack of Biblical manhood in our homes. The movie does a tremendous job of capturing the importance of being a Biblical man for our families. That being said, I see a rather disturbing trend in churches across America in dealing with this situation. Instead of going to God's Word in dealing with the problem, churches are going to study guides of this movie and the book that lead to the movie to address this. Now is there anything wrong with reading books and using them to help us deal with problems? No, as long as we don't see them as an authority on the matter. The problem I have is as the church, we have the Authority on this matter and we aren't using it. The Bible clearly lays out requirements for men in leading the family. Deuteronomy 6, Ephesians 5&6, the book of Titus, and many more CLEARLY pave the way for Biblical manhood. As Christians we do not need a movie, a book, or a resolution to do the things we are called to do. The fact that God commands us to do these things should be enough. Let us remember what the Apostle Paul said, "All Scripture is given by inspiration of God, and is profitable for doctrine, for reproof, for correction, for instruction in righteousness, that the man of God may be complete, thoroughly equipped for every good work" (2 Tim. 3:16-17).